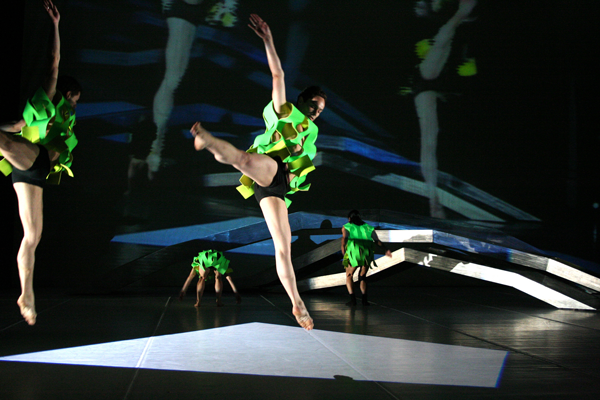 Ballet National de Marseille will present the American premiere of “Metapolis II” at the New York State Theater as part of the 2007 Lincoln Center Festival, July 25–27. The choreography is by the company’s Artistic Director Frédéric Flamand, and the set and costumes are by architect Zaha Hadid. In “Metapolis II,” Flamand creates a world drenched in shifting shades of blue and green, in which Hadid’s stunning set––three interlocking pieces of silvery sculpture—gives kinetic life to the space as it is manipulated around the stage by the dancers or used as ever-changing décor. Live feeds of the performers on stage combined with filmed imagery of futurist urban spaces, airports and disaster footage add to the accumulating visual complexity of the work, abstractly suggesting the growing complexity of contemporary urban life and the implosion it threatens. Consider the Yeats line: “Things fall apart. The centre cannot hold.” But moments of tenderness and intimacy among the dancers offset the bleakness. In a word, Flamand mines the possibilities of technology, architecture and the human body in space to pose questions about reality, virtual reality, human relationships in a rapidly changing future and technology’s threat of dehumanization. As in Flamand’s collaboration with Hadid, the concepts for the ballets are jointly created by choreographer and architect; Flamand choreographs the dance and the selected architect creates the scenography. The result is a stage that brims with contemporary ideas expressed through the movement and set design. The evening curtains for Ballet National de Marseille’s performances at New York State Theater are at 8pm. Tickets are $50-70 and are available by calling 212-721-6500, at the box office or online at www.lincolncenter.org. New York State Theater is located at 63rd Street and Broadway. Flamand’s appointment as artistic director of Ballet National de Marseille was a bold move given the company’s artistic history. BNM was established in 1972 by Roland Petit whose ballets, while considered innovative and at times shocking because of their subject matter and highly theatrical, expressive style, are radically different from Flamand’s conceptual approach to the art form. The last time Ballet National de Marseille performed in New York was in 1983, when it was still under Petit’s directorship. Originally trained in theater, Flamand established the Belgian experimental dance-theater troupe Plan K in 1973, integrating visual arts and audio-visual technology into dance performances and laying the foundations for the interdisciplinary approach that marks his work today. After his 1991 appointment as artistic director of the Ballet Royal de Wallonie, Flamand created his own works for the neo-classical and ballet company which he renamed Charleroi/Danses. Flamand was artistic director of the Venice Biennale’s first international Contemporary Dance Festival in 2003. In 2004 Flamand co-founded D.A.N.C.E. (Dance Apprentice Network Across Europe) with William Forsythe, Wayne Mcgregor and Angelin Preljocaj to develop an elite group of Europe’s finest young dancers. In September 2004, he was appointed general director of the Ballet National de Marseille and the city’s Ecole Nationale Superieure de Danse. Flamand has taught at the University of Architecture in Venice since 2004, running interdisciplinary creative workshops that center on dance. Born in Baghdad in 1950, Zaha Hadid became the first woman to receive the Pritzker Architecture Prize in 2004. The prestigious award is the highest honor in the field and architecture’s equivalent of the Nobel Prize. In addition to being the subject of a major retrospective at New York’s Guggenheim Museum in 2006, Hadid’s work has been represented at galleries and museums internationally. Her most well-known projects include the Vitra Fire Station and the Lfone pavilion in Weil am Rhein, Germany; the Mind Zone at the Millennium Dome in Greenwich, UK; a Tram Station and Car Park in Strasbourg, France; and the Contemporary Arts Center in Cincinnati, OH. More recently, she held the Kenzo Tange Chair at Harvard University’s Graduate School of Design, the Sullivan Chair at the University of Illinois’s School of Architecture in Chicago and has held guest professorships at the Hochschule für Bildende Kunste in Hamburg, Germany. In addition, she was made an Honorary Member of the American Academy of Arts and Letters, a Fellow of the American Institute of Architecture and a Commander of the British Empire. The fast-growing popularity of the company and the recognition of its unique place on the French landscape is reflected in its jam-packed tour schedule: Copenhagen, Denmark (August 30–31); Biarritz, France (September 7); Barcelona, Spain (October 11–14); Cannes, France (November 23); Luxembourg City, Luxembourg (December 14–15); and Paris, France (January 10–13 & 16–19).